Decorated Vietnam Veteran / Artist /Educator, Frank Romeo, has made a life’s study of the effects of PTSD on veterans of every generation. He knows what the experts say: that 20% of the male homeless population are Veterans and that there is a strong correlation between PTSD and homelessness. After decades of work in high schools, where he has educated young people about the realities of war, Romeo is hitting the streets. On March 1, 2019, the day he celebrates his 70th birthday, Frank Romeo will begin a 750-mile, three-month walk across New York State. Developed with the assistance of Mr. Thomas Ronayne, Director of the Office of the Suffolk County Executive Veterans Service Agency, Romeo’s itinerary will include 25 homeless shelters that span the state. Romeo will engage the homeless veterans he meets in a conversation about his own 50-year fight with PTSD. Romeo believes that these veterans will respond with equal candor and will tell of their own personal struggles with PTSD and homelessness. In his thirty years of advocating for PTSD awareness, Romeo sees a disconnect between the younger generation’s understanding of the idea of war and the actual reality of war. Romeo believes that more education concerning the realities of war and PTSD are essential to understanding and confronting veterans’ issues. “Walk With Frank” will tell the story of Frank Romeo’s 50-year journey, which began in 1968 when he enlisted in the US Army to fight in the Vietnam War. By documenting Romeo’s conversations with homeless veterans, the film will provide insight into PTSD and its impact on society. The film will also honor the veteran by giving him/her a voice. The film seeks to increase public awareness of the impact of PTSD on veterans, their families, and society. Walk With Frank, Inc. will develop strategic alliances with regional and national Veterans, civic, and educational organizations to broaden opportunities for screenings throughout the United States. As an educational resource on the impact of PTSD, the film will be promoted to related regional and national conferences. Plans also include representation by a digital platform distributor so that the film will be accessible via streaming. The film will also be listed in withoutabox.com to ease its submission to film festivals throughout the world. DVDs will be available on the film’s website, and will be marketed to national discount retailers, such as COSTCO and Walmart. Romeo served in the U. S. Military from 1968 to 1970 and was deployed to Southeast Asia in 1969. He served in the 199th Light Infantry Brigade. This air-mobile specialty unit was designed for covert warfare and was used in many hostile situations. A recipient of the Purple Heart, Romeo is one of the longest-living veterans diagnosed with 100% post traumatic stress disorder-related disabilities. The cause and effect of this socially-crippling disease has been the focus of his life’s work for the past three decades. 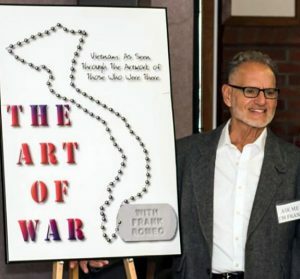 Through his innovative program THE ART OF WAR, Frank has reached tens of thousands of individuals around the country who have been touched in some way by PTSD. Seeking a better understanding of his former enemy and of his own struggles with PTSD, Frank returned to Southeast Asia in 2014. Transmitting from the scenes of former battle zones, Frank used his daily blog Got My Second Wind and Skype sessions to educate American students and the public on the impact of war and war’s effects on society. His Skype sessions were covered by Channel 12 News NY, and recognized with their “Making A Difference” Award. Additionally, he has been honored by the National Veterans Art Museum in Chicago where story was featured in the award-winning mini-documentary Fallen Heroes. Romeo has also been honored by both the Australian and American governments for work with veterans. 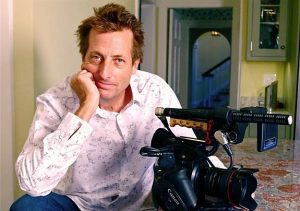 Richard Chisolm is an Emmy award-winning documentary filmmaker and cinematographer with thirty years of production experience. Based in Baltimore, Maryland he has shot films and television programs on a wide variety of subjects in the United States and abroad. Deeply committed to the value of real stories and the adventures of real people, Chisolm has worked for PBS, National Geographic, BBC, Discovery Channel, HBO, and many other broadcast entities. He was a Camera Operator on the HBO series “The Wire” and the Director of Photography for both of ABC’s “Hopkins” prime time medical documentary series (2000 and 2008). He is also the recipient of a Peabody Award, a Columbia DuPont Journalism Award, two Kodak Vision Awards, four CINE Golden Eagles, and is a Distinguished Alumnus of the University of Maryland. All lead donors will be acknowledged in the film in the traditional credit section, and in all print programs. The order of the listing of accredited donors will be by size of donation (largest donors first); credited donors within the same donation category will be listed in alphabetical order. All lead donors will receive 5 copies of the DVD and will be offered complementary and preferred seating at all premiere screenings. Requests for anonymity by donors will be rigorously respected.